Fifty years ago, a baseball team captured the hearts of generations of New Yorkers by winning a World Series against improbable, if not impossible odds. That team, nicknamed “The Amazin’ Mets” continues to live on in the memories of those who experienced a special time in New York baseball. One of the players on that team, Art Shamsky, has written a book (“After the Miracle, the Lasting Brotherhood of the ’69 Mets”) recounting each game the Mets played against the powerhouse Baltimore Orioles. More importantly, the book describes a poignant mini-reunion at the California home of the Mets ace pitcher, Hall of Famer Tom Seaver, who is sadly battling dementia. Seaver recently announced the diagnosis, which came as a shock to baseball fans around the country who saw him pitch and still imagine the right-hander as forever young in their hearts and minds. Bud Harrelson, the Mets gritty shortstop, who made the trip to see his former teammate, is also fighting dementia, making this reunion perhaps a final chance to reminisce about that great season a half century ago. Shamsky, along with fellow outfielder Ron Swoboda, pitcher Jerry Koosman and Harrelson got together at Seaver’s Fresno, California home where he has been growing grapes and making wine since he retired as a pitcher and longtime broadcaster of both the Mets and Yankees and before that NBC’s Game of the Week. According to Shamsky, it was a hit or miss opportunity to make this reunion happen. Seaver’s wife of more than 50 years, Nancy told him that Tom has good and bad days and to call before heading over. Fortunately, on the day the group made the long drive from San Francisco to Seaver’s home, Tom was having one of his good days. The former teammates had lunch, walked in the vineyards and went back in time to relive the great moments of their championship season. As a 3rd grader in 1969, I wasn’t yet following the day-to-day goings on in sports that closely in New York. However, as the Mets became the talk of baseball in September and won the division and eventually the National League pennant, we all started to pay attention. During lunch recess, our elementary school wheeled these old, black and white TV’s into the auditorium so we could watch a few minutes of the World Series. Remember, those were the good old days when the Series was played in the afternoon. When the Mets won the World Series in game five, a teacher came outside as we were waiting for the school bus and told us the news. The celebration on the ride home was as jubilant as what was going on at Shea Stadium. I recommend the book for anyone who would like to relive that special time or for those who want to find out what made it so meaningful. Click here to listen to my conversation with Art Shamsky. 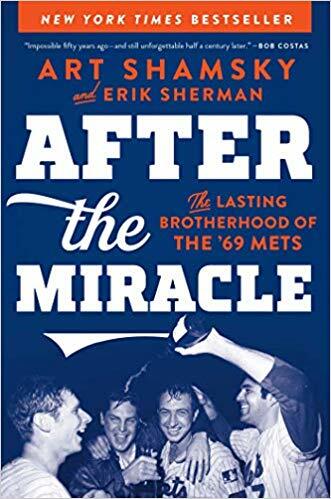 Doug Miles talks to Art Shamsky about his book on the 1969 Mets “After the Miracle, The Lasting Brotherhood of the ’69 Mets”. You may order the book below in the Amazon box. Don Henderson and Doug Miles recap the first week of major league baseball, preview the NHL playoffs and Masters. 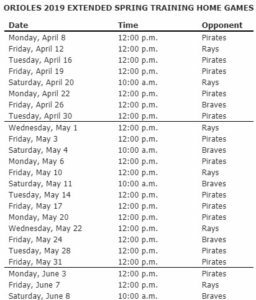 (Bradenton, FL) The Bradenton Marauders will open the 10th season in franchise history beginning Thursday, April 4th against the Pt. St. Lucie Mets on the road. The team’s home opener in Bradenton is Saturday, April 6 also against the St. Lucie Mets, with gates opening at 5:00 p.m. and the first pitch of the season at 6:30 p.m. Opening Night features the ZOOperstars troupe of inflatable entertainers who will take the field between innings. Each of the first 1,000 fans in attendance will receive a Marauders in the Majors Deck of Playing cards. After the game there will be a fireworks show from Zambelli Fireworks. Each Saturday game will also feature Baseball Bingo. During the game, a used baseball equipment sale will be held inside the ballpark. Equipment used by Pirates players during Spring Training at Pirate City and LECOM Park will be available for sale. Proceeds will benefit Pirates Charities. Marauders fans have their first chance to meet the Marauders at LECOM Park on April 2. The event begins at 5:30 p.m. and will be attended by every player and the coaching staff. A formal announcement of the roster will take place at approximately 6:45 p.m., followed by an autograph session on the field. There is no charge to enter the event. Sunday, April 7 features the first Kids Fun Run of the season. After the game all fans 12 and younger can take part in a fun run around the bases. The game begins at 1:00 with gates opening at noon. Sunday games at LECOM Park will include “kids concessions stands” focused on providing food options for younger fans, as well as opportunities to spin the prize wheel and win Marauders prizes. The LECOM Park ticket office opens for the season on Tuesday, April 2. It will be open on Tuesday-Friday non-gamedays from 10:00 a.m.-4:00 p.m. On gamedays the box office will be open on weekdays from 10:00 a.m. until the end of the game and on weekends from two hours before first pitch until the end of the game. The box office will open two hours prior to any 10:30 a.m. games. As the major league baseball season gets underway, a look back at one of the great broadcasters of the game, Joe Garagiola. This interview is from 2008. 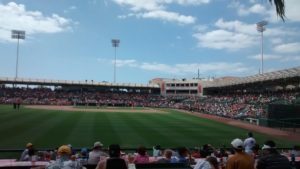 (Sarasota, FL) MASN, the television home of the Baltimore Orioles, today announced its Major League Baseball schedule for the 2019 season. All Orioles games broadcast by MASN will be available in crystal-clear high definition, including the season opener at Yankee Stadium against the New York Yankees on Thursday, March 28. Other highlights of MASN’s 2019 Orioles schedule include interleague games against the Washington Nationals (June 16-17, Aug. 27-28), and the Colorado Rockies (May 7 24-26), San Francisco Giants (May 31-June 2), San Diego Padres (June 25-26, July 29-30), Arizona Diamondbacks (July 22-24) and Los Angeles Dodgers (Sept. 10-12) of the National League West. The Orioles will have 89 games air live on MASN and 73 games air live on MASN2. Sarasota resident Gary Thorne and Jim Hunter will again share play-by-play duties in the MASN broadcast booth, where they will be joined by Baseball Hall of Fame pitcher Jim Palmer and Orioles Hall of Fame shortstop Mike Bordick as primary color analysts, with former Orioles pitcher Ben McDonald and Orioles Hall of Fame second baseman Brian Roberts calling select games as color analysts. Thorne begins his 34th season of Major League Baseball play-by-play coverage, his 13th with the Orioles, and Hunter returns for his 23rd season as part of the Orioles broadcast team. Palmer enters his 27 season as a color analyst for the Orioles, his only team in a 19-year major league career. Bordick is in his eighth season in the MASN booth, McDonald in his fourth and Roberts in his second. A full listing of cable, satellite and fiber optic channel positions will be available at www.MASNsports.com.